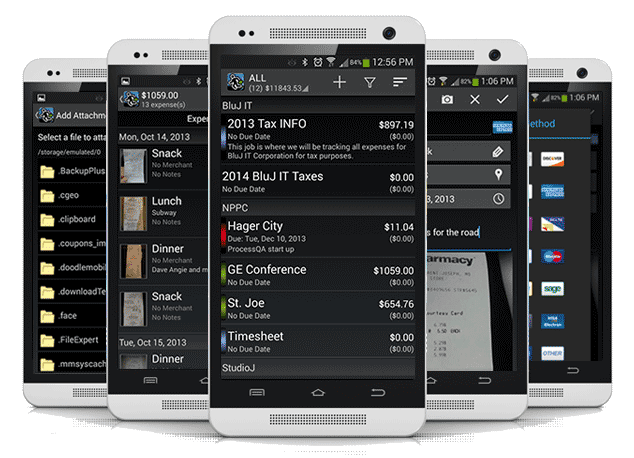 Expense Manager by BluJ Business is an application that was created for business men and women to ease the tracking of business related items such as expenses, mileage, time, and payments for jobs or trips. It has been tailored to allow easy entry of these items throughout job or trip. Once complete, Expense Manager allows the data to be viewed and exported in a variety of ways both as PDF reports and CSV exports. These reports and exports can then be viewed on the device or emailed to whoever needs them. The CSV export is also great for importing into applications such as Quicken and Quickbooks. Managing different clients with features for bill rates, billing increments, etc. Creation of jobs and association to clients. Dynamic job states: Active, Billed, Overdue, and Paid. Tracking of expenses, mileage, time, and payments within the different jobs. Fully functional application without network connections; although, when connected exchange rate data is able to be imported into Expense Manager by BluJ Business. Multinational currency support, including the ability to create and manage custom currencies. Allowing for a preferred currency, unlimited number of currency exchange rates, and currency indication at the expense level. Exchange Rate data importing from the internet. Expense tracking with payment method, tags, merchants, notes, and pictures and attachments of receipts (receipt preview included). Receipt capture makes use of camera functions such as auto-focus, auto-flash, compression, etc. Mileage tracking in both imperial or metric units. Allowing mileage entry via starting and ending odometer readings as well as total distance. Payment management - as customer payments are received, they too can be tracked within Expense Manager by BluJ Business. These payments as well as due dates can be used to auto calculate job statuses. Extensive Reporting capabilities such as Job Details, Client Summaries, Year to date reports, etc. Addition Quick Reports easily allowing the generation of select reports within two screen touches. Collected data is able to be exported in a CSV format for import to other applications such as Excel and QuickBooks. Reports and exported data are able to be emailed WITHOUT requiring additional fees. Ability to view reports from the Android device, sorting the data in a variety of ways. Manage reimbursement rates for personal vehicle use. Tag Management that allows for creation and deletion of tags and tag groups for association with Expenses, Time and Mileage. Backup/Restore to/from SD card and the Cloud to ensure that your data doesn't get lost even if your device does. Great application for Expense Reporting and tracking trip expenses when traveling for business. Most applications charge hidden fees through the use of their servers for report generation; not Expense Manager by BluJ Business. Android is a trademark of Google Inc. Apple, the Apple logo, iPad, iPhone are trademarks of Apple Inc., registered in the U.S. and other countries. Google Play and the Google Play logo are trademarks of Google Inc. IOS is a trademark or registered trademark of Cisco in the U.S. and other countries and is used under license.